3. In what denomination has it been issued? 5. How many stamps have been issued on this occasion. 6. 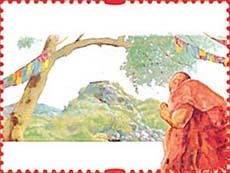 What is depicted on the other stamps? 7. On which earlier occasion was a stamp issued on this subject? 1. Gridhakuta hills of Rajgir from where Lord Buddha delivered many of his sermons. 6. (a) Mahabodi Temple in Bodh Gaya. (b) Dhamek Stupa of Sarnath. (c) Mahaparinirvana Temple of Kushinagar. 7. On Buddha Jayanti on 24.5.1956..
8. The Calcutta Security Printers.